A short description of the major areas of research are shown below. For research publications, please see the Publications section. Recently, there has been a large demand for more and taller wood structures because of its benefits as a sustainable and renewable construction material. However, because wood is a more brittle material than steel or reinforced concrete, there is a need to develop seismic resistant systems for wood structures. With this in mind, two different new and innovative heavy timber structural systems have been developed. These systems combine wood with small, selective amounts of steel at critical locations to leverage the combined advantages of both materials. Some examples of innovative timber-steel connections include a replaceable ductile steel link element for heavy timber moment-resisting frames (Fig. 1) and a glued in rod timber connection for adaptation of advanced bracing systems into heavy timber buildings. 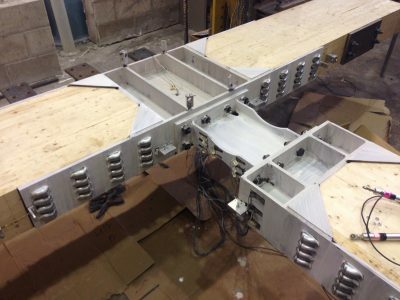 Hybrid simulation is a newly emerging testing technique that combines the strengths of analytical modelling and experimental testing to analyze the response of a complete structural system. In doing so, hybrid simulation is able to capture the exact nonlinear behaviour of complex structural components or subassemblies through experimental testing while at the same time supplementing it with simulation of the rest of the structure through finite element modelling to capture the global system response of an entire structural system. Fig. 2 shows an example hybrid simulation for a two-storey moment frame in which a first storey column is tested experimentally in a laboratory (physical substructure) while the rest of the structure is modelled numerically (analytical substructure). 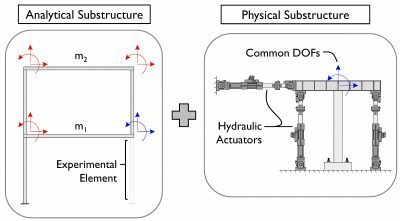 Current research is focused on using hybrid simulation to capture the overall system-level response of multi-storey heavy timber and reinforced concrete shear wall structures. Current design standards only consider one possible level of performance for structures subject to natural hazards. For example, they ensure that structures do not collapse under expected earthquakes, or they ensure that structures meet a minimum standard fire resistance time to allow occupants to escape. However, design standards do not consider the residual fire resistance of a structure following a major earthquake, or the effects of a past fire on the current seismic resistance of a structure. The goal of this research is move towards the development and use of performance-based standards and guidelines that allow an engineer to consider and design for a higher level of performance beyond collapse-prevention or life safety. This research is carried out through the use of the multi-hazard infrastructure protection facility which is able to integrate large-scale multi-hazard experimental and computer simulation research for fire, earthquake, blast (explosions) and wind.